Two St. Louis dads put their heads together to produce brainskinz™ interchangeable-shell helmets: These are Super Cool! Two St. Louis dads put their heads together to produce brainskinz™ interchangeable-shell helmets These are Super Cool! 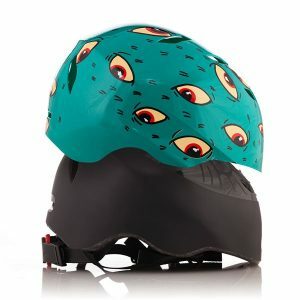 Do your kids dislike wearing the traditional bike helmets for biking and skateboarding? Maybe it is time to try a new one! After five years in the making, Brainskinz Helmet Systems, LLC has officially launched its line of brainskinz™ interchangeable-shell helmets. Combining safety and style, brainskinz™ helmets have been thoughtfully designed with kids in mind. SoCal City Kids received samples and I love the designs of them! I had a few of our younger testers try them out and they were a big hit! The kids loved the designs and also said that they are comfortable to wear! I think it is important that kids like them because well..otherwise they just may not wear them! brainskinz™ are fun, changeable helmets that your kids will love to wear! brainskinz™ are colorful, playful, and just plain fun. brainskinz™ can be worn pretty much any time your kids are in motion, and when they get tired of a design, they can simply detach the current Shell and choose another from their collection. Keeping it fresh means keeping them on their melons! Self Disclosure: I received free samples to facilitate this post. Photo was provided.